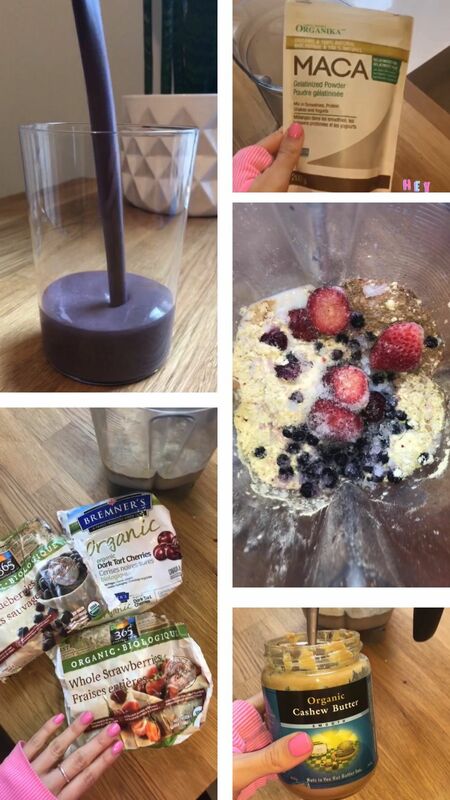 My favourite smoothie recipe is here! I like this one because it’s easy and high in protein, healthy fats, vitamins & antioxidants. The best part about this smoothie is that it’s tailored to balance hormones. Since adding it to my diet, I’ve noticed less sugar cravings, less acne, more lean muscle, less PMS symptoms, better mood and boosted libido! This smoothie will benefit anyone dealing with PCOS, weight fluctuations, menopause, infertility, fatigue and hormonal acne. Most of the ingredients don’t expire too fast so you don’t need to make grocery runs every time you want a smoothie. I use the Vitamix to blend but a Magic Bullet is fine too. Watch me make this smoothie in my highlight story “SMOOTHIE” on my instagram. The base: 1/2 coconut water + 1/2 almond or coconut milk (I use anywhere from 1/2 cup to 1 cup of each depending on how much volume I want to drink)WHY: Coconut water is filled with electrolytes for post-workout or to simply hydrate yourself. Dairy can be inflammatory and worsen imbalanced hormones hence why I keep it milk and dairy-free. WHY: This is a plant-based protein because I find whey protein tends to flare my acne. Sunwarrior is a blend of different types of plants (not just pea protein) and therefore has almost the same amino acid portfolio as whey offers. WHY: Cacao is a powerful antioxidant that revs your energy without jitters. It is high in magnesium for relaxing your nervous system and muscles. 1/2 tsp Ground Flax Seed (Buy them whole and ground at home to keep it fresh)WHY: Flax is estrogen-modulating, a good source of fibre and omegas. My 93 year old gramma actually grinds the flax seeds and sends them to Toronto for me (adorable, right?)! She takes flax every day for maintaining healthy estrogen levels which protects bone density. Breast cancer or endometriosis? Talk to your naturopathic doctor before adding into your diet. If you are making this smoothie for your male partner or male kids, skip the flax for their serving. WHY: Healthy fat will help you feel fuller for longer without sugar cravings. Handful of Organic Frozen Berries I use blueberries, black cherries and strawberries.WHY: Antioxidants, baby! Your hormones, ovaries and skin LOVE the power of organic berries. I don’t use bananas in my smoothie because they have high glycemic index. Handful of Spinach (fresh or frozen)WHY: Greens are very alkalinizing. When considering hormonal health (especially fertility and acne), your body should be slightly more alkaline compared to acidic.